Palladium was discovered in 1803 by William Hyde Wollaston and was named after the asteroid Pallas. 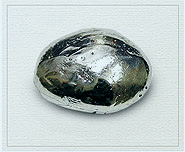 It is a precious metal and a member of the platinum group of metals. Its natural color is white and its so light that it unlocks the creative genius of designers, allowing jewelry that is bigger, bolder, and brighter than before. Like platinum also palladium considers to be rare, white in color, extremely durable, and unaffected by elements in the air which make other metals tarnish. Used for jewelry, palladium is made 95% pure and 5% of other platinum group metals such as iridium and ruthenium. For guaranteed quality, palladium will be marked with Pd, PD950 or 950 Pd. The natural white color of palladium is permanent and unlike white gold does not require rhodium plating over time. Over time palladium will show the signs of everyday wear however the surface is easily restored to the original luster by cleaning and polishing. Soaking palladium jewelry in a mild solution of soap and warm water and gently scrubbing it with a soft-bristled brush is pretty much all that is needed to keep the metal looking good. To keep your jewelry shining and scratch-free, store them in their original boxes, soft cloth bags, or a fabric-lined jewelry box. Tiffany Jones Designs is proud to offer jewelry in 14k and 18k white and yellow gold. Platinum, silver and other metals are also available by special order..
We can customize any jewelry in palladium metal by special order, please speak with our jewelry expert at 1-800-988-5145.